SPRINGFIELD, Il. (May 28, 2018) – It may have come a day later than originally planned due to Sunday’s weather postponement, but American Flat Track made good on its Memorial Day tradition. 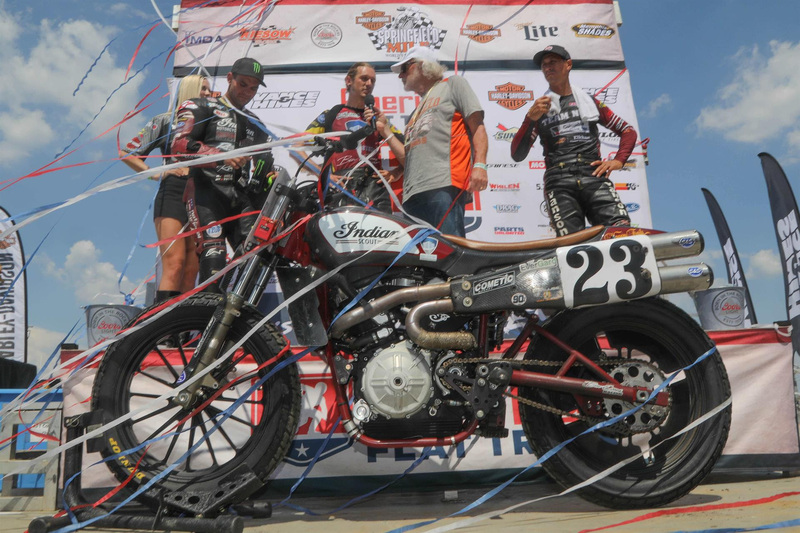 The world’s greatest dirt track motorcycle racers once again put on a spectacular show for the crowd who came back out to the Illinois State Fairgrounds on Monday for the series’ crown jewel event – theHarley-Davidson Springfield Mile I. In the early going, Carver was involved in an intense five-rider fight for the lead that included some of the sport’s living legends – Jared Mees (No. 1 Indian Motorcycle Rogers Racing SDI Scout FTR750),Kenny Coolbeth (No. 2 Nila Racing/Columbia Avionics Indian Scout FTR750), and Bryan Smith(No. 4 Indian Motorcycle Racing backed by Allstate Scout FTR750) – as well as an on-form rising star in Davis Fisher (No. 67 Double D Performance/RMR/Bob Lanphere Indian Scout FTR750). In just five days the AFT Twins and Singles competitors will be in Central Kentucky for the Indian Motorcycle Red Mile presented by Indian Motorcycle of Lexington on June 2 in Lexington, Ky. Live coverage can be viewed on FansChoice.tv beginning at 2:30 pm ET with Opening Ceremonies scheduled for 6:30 pm ET. Tickets are on sale now and can be purchased athttps://www.showclix.com/event/red-mile-2018. NBCSN and FansChoice.tv are the official homes for coverage of American Flat Track. For the 2018 season, NBCSN’s coverage of AFT moves to highly-coveted, weekend afternoon programming slots within two weeks of each event. The complete schedule for AFT on NBCSN can be viewed athttp://www.americanflattrack.com/events-nbcsn/. FansChoice.tv remains a cornerstone of AFT’s digital strategy, providing live streaming coverage of every event on AFT’s live page while previous events and exclusive features are available on AFT’s VOD page. American Flat Track is the world’s premier dirt track motorcycle racing series and one of the longest-running championships in the history of motorsports. Sanctioned by AMA Pro Racing in Daytona Beach, Fla., the series is highly regarded as the most competitive form of dirt track motorcycle racing on the globe. For more information on American Flat Track, please visithttp://www.americanflattrack.com, like us on Facebook, follow us on Twitter, check us out onInstagram, live stream the events at FansChoice.tv and catch all the American Flat Track racing action on NBCSN.